I’m glad I was already mid-editing my LinkedIn profile. I have a new honour to add – I just won the Nobel Peace Prize. It's not every day you get to put "Am a joint winner of Nobel Peace Prize" on your CV. Yes, it’s official. The European Union has just been awarded the Nobel Peace Prize for 2012. Of course, much like when Obama won, this has met with derision from many. I’ll admit, the announcement bemused me for a moment. But I do believe that this prize is merited. The Prize is awarded to the person or organisation that has “done the most or the best work for fraternity between nations, for the abolition or reduction of standing armies and for the holding and promotion of peace congresses”. Most EU Council meetings have at least an element of this – they are strongly akin to the Peace Congresses of the pre-war period…and to see 27 national leaders, all of whom lead countries which have previously been embittered by conflict with the others, in peaceful negotiation over their disputes, as opposed to armed conflict, is surely a sight for sore eyes. Europe – a continent at war for centuries – is now in a state of perpetual peace. Because of the EU and its forerunner, the European Coal and Steel Community, war on this continent is unthinkable. The EU’s normative agenda has spread from those original six Member States, down the Iberian peninsula into former fascist states, across Central and Eastern Europe’s former Communist dictatorships, and now is working its way across the war-torn Balkans. “The Nobel Peace Prize for the EU is recognition of the transformative power of the European project that brought a war-torn continent back to prosperity and through its enlargement process helped to spread democracy and freedom to the former Soviet bloc and is a model for reform worldwide. “MEPs now have a decisive say on the EU’s international trade agreements and democracy and human rights are a cornerstone of our approach. “In the latest survey of 25,000 European citizens by Eurobarometer, spreading democracy and human rights across the world was seen to be the most important task of the European Union. David Cameron gave his keynote speech at the Conservative party conference today. There’s a transcript here. It wasn’t a bad speech – not his best, but reasonable. But some of it annoyed me… Cameron showed a strong belief in standing together against globalization, and then expected plaudits when he shouted down such an approach in the European Council. “We’re better together, and we’ll rise together” compared with “Britain comes first”. Anyone noticing a double-standard? Those of you who’ve read me regularly will know I’m vehemently pro-European. But what bothers me most about the europhobe camp is the fact that they so clearly ignore their own arguments when it suits them. Apparently, we’re all better together. And I believe it’s true. We’re living in the era of globalisation. As Cameron said “We are in a global race today. And that means an hour of reckoning for countries like ours. Sink or swim. Do or decline.” That’s true. It’s why I can’t truly support Scottish or Welsh independence, though I am a strong believe in localism and regional autonomy. As barriers come down, as the world gets smaller, the small get squeezed out. Even Britain. We currently punch well above our weight. We assume “[t]hat we can earn our living as a major industrial country…and we will always remain one.” But “[i]t has fallen to us to say – we cannot assume that any longer. ” I agree with Cameron thus far. But then why is he acting so negatively towards our membership of the world’s largest market? If Britain is to compete in the new globalised world, Britain needs to make friends, not enemies. The very fact that Cameron was in a situation where it was 26 vs 1, shows a lack of leadership and strategy. It used to be that Sweden and the Netherlands, Poland and Spain, could be counted on to support British free-market interests. When Cameron has alienated even then, it is a tragic day for Britain. It isn’t even true that the old countries are on their way down. If we take a look at the following graph, the Guardian has made it look like our export market is ever increasing in the developing world, countries such as the BRICS of India, China, and Russia. Which is true, our exports there are increasing, and faster than to most European countries or Commonwealth states. But it takes a second-look to notice that our trade with China and India combined is still less than our exports to Ireland. 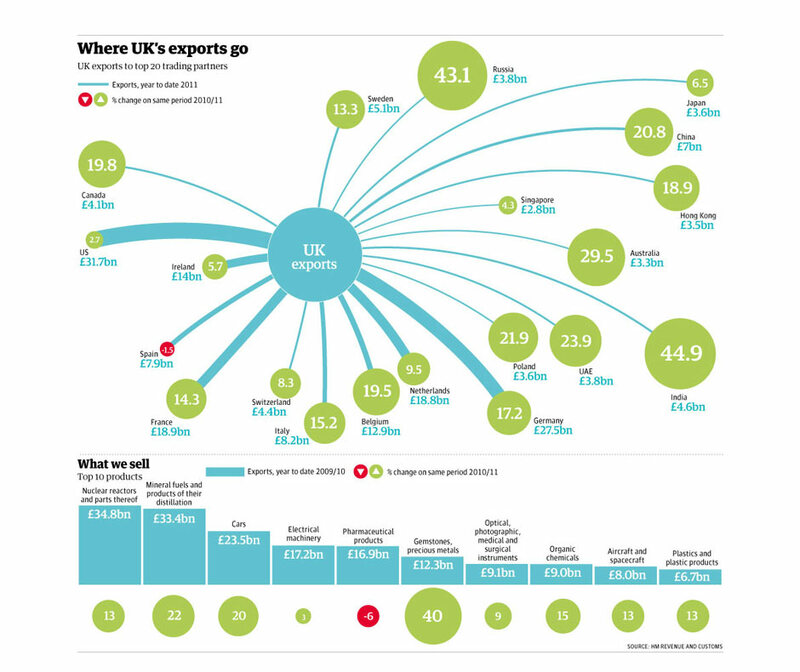 Add in Russia and Hong Kong, and it’s still only equal to our exports to France. And despite Cameron’s attitude, our trade is still growing with the vast majority of Europe. And while Cameron argues that the Old World is “sclerotic, over-regulated, spending money on unaffordable welfare systems, huge pension bills, unreformed public services”, that ignores that Asia is building welfare states across the continent. The demographic crisis that is going to hit China necessitates at least some form of a welfare state. It’s true that they’re not very regulated – but that’s not always a great thing. Remember, regulation is what stops our children’s toys being slathered with poisonous lead paint. It may be true that while we are, at present, having a tough time across Europe “on the other side of the world, China is moving so fast it’s creating a new economy the size of Greece every three months” it doesn’t matter to us if they aren’t buying what we have to sell. As László Andor, EU Social Affairs Commissioner said today in an interview with the FT, Cameron’s attempts to curtail the right of Europeans to live and work in Britain merely serves to damage our economy. Why should we close our doors to the best and brightest, when instead they could contribute to our economy. When the UK economy benefits to the tune of £90bn per year from levy-free trade throughout the 27 country European Union, and yet only pays an £8bn contribution to the EU for access… I cannot find a better example of “we’re better together, and we’ll rise together”. I just wish Cameron would wake up to this. Federalism, not Centralism – why Jack Straw is spouting doublethink. Jack Straw, Labour’s former Foreign Secretary, has decided, in his infinite wisdom, that because the European Parliament suffers from low voter turnout, people treating it as a referendum on the government, and a lack of connection between the EU and the citizens… something radical is needed.